I thought I was doing my first son a service when we taught him to be scared of drowning. Every time he would get near a pond or pool, we would warn, “You better not go near that! You might drown!” This method proved effective for keeping him away from water, but when he turned four and we decided he was old enough to learn to swim, we learned we had created a water monster. He was terrified. We quickly learned that in our effort to keep him water safe, we taught him to think water was bad. And that proved to make teaching him to swim very challenging. He never wanted to put his head under water or learn to float on his back. Then one day he got brave and jumped in without floaties and I had to dive in and pull him out. This only reinforced his fear of water. And convinced me teaching a child to swim was nearly impossible! Once he finally learned to swim, I realized I would not make the same mistakes with my next sons. So here’s what I would recommend as my favorite water safe tips for teaching children to swim and making the pool safe! Babies aren’t born with a fear of water, but they can develop one as they grow if they aren’t exposed to it. So it’s smart to get them swimming with you early or in lessons early. Get them used to putting their head in and blowing bubbles early. This way they don’t even know to be scared. 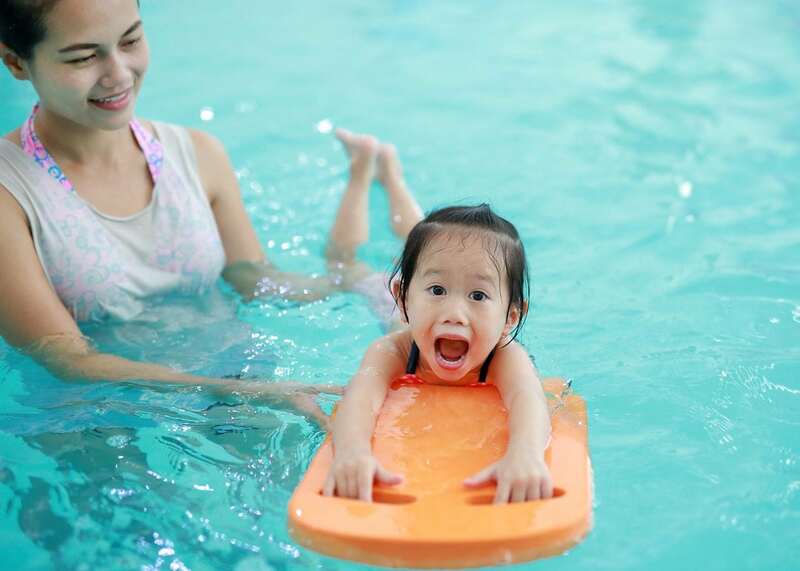 Enrolling them in a Mommy and Me swim class is a perfect way to start! You need to teach your children to stay away from pools. But be careful to monitor your language with these warnings because they need to know water is good but not safe until they learn to swim. “We don’t get in water until we know how to swim! Are you ready to go to swim lessons?” This makes them see the boundary but understand that swimming makes water fun. This technique only exists in some larger areas, but this tends to be a quick, week-long method where one instructor teaches children ages infant through age 5 how to fall in, flip on their backs and swim to the side. The plus side of this technique is that by the end of the week, your child safely knows how to fall in and get to the side. The downside is that if your child is young, they tend to cry throughout the training. Because they don’t understand what they’re learning. So it’s not always pretty. We did this method with all of my sons at age 2, 3, 6. And I learned that once they are old enough to talk and comprehend, it’s my favorite method. Because it is so quick and effective. But for a two year old, it can be emotional. However, if I had a pool in my backyard, I would absolutely say this method is a must! This is a specific type of survival swim that is nationwide founded in 1966. It is a longer, but more detailed approach to learning to swim that allows kids to learn over a six-week period with short increments of swimming daily. (Weekends not included.) It involves eating a special diet and leads kids along a specific progression of swimming where they can get to the side and float by the end of the six weeks. Traditional swim lessons are a great way to learn to swim if a parent has time and money to invest in the process. We started my son at a swim academy when he was three. Many of the kids in his class had been going since they were infants and were swimming well. If you have time, this method is wonderful. But if you are trying to get a child water safe in a shorter timeframe, this may not be right for you. After survival swim, we hired a private swim instructor to meet with our toddler. And this is where we saw impressive advancement quickly. Since he entered lessons already knowing how to fall in and float on his back, she was able to use any skill he was willing to show her to advance his abilities instead of having to follow a specific formula like group lessons typically require. This allowed him to improve rapidly. Once your child has learned to swim or has learned a swimming skill, it is so important to keep your child in the water. It seems children advance the fastest and get the safest when you consistently let them build on their skills. If they learn to jump in and swim to the side but then are out of the pool for six months, they will likely lose that skill. For purposes of remaining safe, consistency is key! Even though I have three swimmers now, the public pool can at times make me feel worried that someone could still get pulled under or jumped on. Last summer I decided it was worth it to me to ask an extra person to come along to help out. There is always the option of hiring a sitter to come along for the ride, but it’s also possible to ask if a neighbor or preteen wants to come along just to play. They often can keep an eye on older ones while still having fun. We went to a pool party last summer and we ended up having several children swimming all at once. I was at the pool with all four of my children, including my new preschool swimmer and my baby. I intentionally asked my neighbors to help me keep a watch on the boys. That way if for any reason I did turn away at the wrong moment, they would see something too. When you have a new swimmer, it’s important to let others know that the child is a new swimmer. Children tend to like to horse around in the water, so I always remind older children not to tug or pull on the newer swimmers. We live in a warm climate and many of our friends and neighbors have pools. I’ve learned its important to ask parents if they have a pool before my child goes to play. If they say yes, I make sure and ask if the back door is locked and if they have something to keep kids out of the pool like a fence or cover. I then remind my child that pools are not a place we play or explore without adults. Every summer I try and review what to do if someone did end up in the water without a floatie. Yes, I don’t want to imagine anything ever happening. But I also know that if something did happen, I want to be prepared. Here are two videos you might find helpful: how to save a drowning child and child water rescue breathing. What are some of your favorite water safety tips? I would love to hear! The Thumb Sucking Habit: How Long Is Too Long?